Most male animals that are kept for companionship, work, or food production (stallions, dogs, tomcats, bulls, rams and boars) are neutered (castrated) unless they are intended to be used as breeding stock. This is a common practice to prevent unacceptable sexual behavior, reduce aggressiveness, and prevent accidental or indiscriminate breeding. The intact male (tomcat) is likely to roam, fight with other males, and spray and is of course, strongly attracted to seek out and mate with intact females. Tomcat urine is particularly malodorous. Overall the intact male cat can make a most unpleasant household companion. How does castration affect behavior? "The only behaviors affected by castration are those under the influence of male hormones." The only behaviors affected by castration are those under the influence of male hormones (these are called sexually dimorphic behaviors). A cat's temperament, training, and personality are the result of genetics and upbringing, and are generally unaffected by the presence or absence of male hormones. 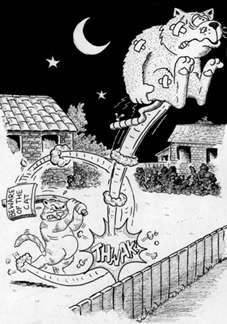 Castration is unlikely to calm an overactive cat or decrease aggression toward people. Since the male brain is masculinized by the time of birth, castration will reduce some, but not all of the sexually dimorphic male behaviors. If performed prior to sexual maturity castration will help to prevent the development of secondary sexual characteristics such as penile barbs, large jowls and glands at the dorsal part of the cat's tail. The operation of neutering or castration of male cats is called an orchidectomy. The procedure involves general anesthesia, and an incision is made over each side of the scrotal sac so that each testicle can be excised or completely removed. External sutures are not generally required. In males both testicles descend prior to birth from inside the abdominal cavity through the inguinal canal into the scrotal sac. In some cats one or both testicles do not descend fully into the sac and may either remain in the abdomen or may be retained anywhere along the inguinal canal path to the scrotal sac. "Vasectomies are not performed in cats since this procedure only sterilizes the cat, but does not stop production of male hormones." These cats are called cryptorchid and a more extensive surgery will be required to locate the testicles and remove them. 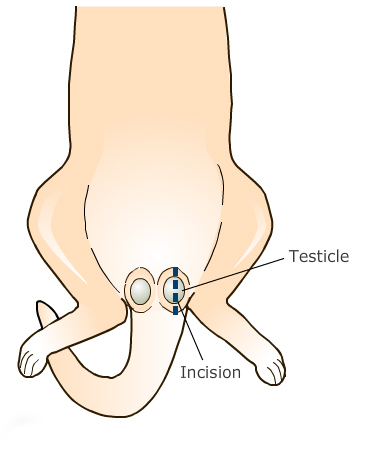 If these retained testicles are not removed, they will continue to produce hormones and the cat will display behaviors typical of intact male cats. Vasectomies are not performed in cats since this procedure only sterilizes the cat, but does not stop production of male hormones. It is both sterilization and removal of the male hormones that provide the behavioral benefits of castration. What are the benefits of neutering? Millions of cats are destroyed across North America each year because there are far more cats born than homes available. A single male cat can father many litters so that neutering of intact males is essential for population control. Although sexual desire will be greatly reduced by castration, some experienced males may continue to show sexual interest in females. "Neutering reduces or eliminates spraying in approximately 85% of male cats." The most common behavior problem in cats of all ages is indoor elimination at locations other than the litter box. A large number of these cases are cats that spray or mark walls and other vertical household objects. Adult male cats have an extremely strong urge to mark territory, both indoors and out. Neutering reduces or eliminates spraying in approximately 85% of male cats. Cats, whether neutered or intact, can get into fights but most inter-cat aggression is seen between intact males. This is a direct result of competition between male cats, and because intact male cats roam and protect a much larger territory. If these fights lead to punctures or wounds that penetrate the skin, abscesses are a common sequel. Neutering reduces fighting and abscess development in male cats. Intact males have much larger territories and wander over greater distances than females and neutered males. The urge to roam may be particularly strong during mating season. Castration reduces roaming in approximately 90% of cases. Although neutering greatly reduces sexual interest, some experienced males may continue to be attracted to, and mate with females. "Male urine odor is particularly strong and pungent. " Male urine odor is particularly strong and pungent. Castration leads to a change to a more normal urine odor. Many owners claim that their intact males become much cleaner, less odorous, and better self-groomers after neutering. Abscess formation as a result of fighting is far less frequent and some of the secondary sexual characteristics such as the over-productive tail glands in the condition known as "stud tail" can be dramatically improved. Does neutering lead to any adverse effects on health or behavior? There are many misconceptions about the effects of neutering on health and behavior. Neutered males are no more likely to become fat or lazy provided they receive a proper diet and adequate exercise. With less roaming, fighting and mating activity, calorie intake may have to be reduced and alternative forms of play and activity provided. Behaviors that have developed independent of hormonal influences such as hunting are not affected. Regardless of age at which it is performed, neutering does not have any effect on physical development, (overall height and weight, urethral size). Although neutering prior to puberty appears to have similar effects to neutering post-puberty, every attempt should be made to neuter prior to puberty before the cat develops problems, experiences and habits associated with sexual maturity.